You don’t want to pay to heat and cool the outside so why are you? Contact us today and see if you qualify for our air sealing service at no cost! 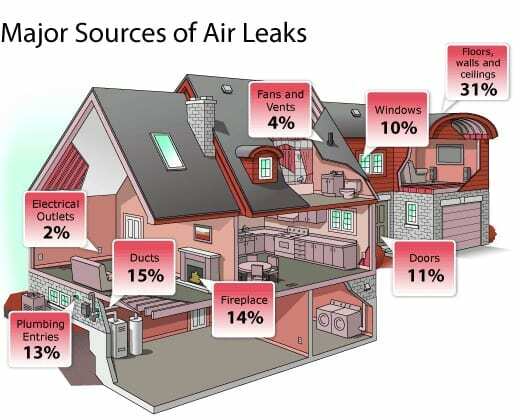 Your heated and cooled air is leaking out of all those gaps and cracks in your home. Sometimes the areas of leakage are obvious but for the most part not easy to detect. Green Improvement Consulting utilizes tools that will identify all the hidden areas in your home that are leaky. Using our blower door and infrared technology enable us to determine where your home is leaking the most air. Our trained staff will then use materials such as caulk, foam and weather-stripping to seal your house making it more comfortable and affordable for you and your family. Decreasing air flow decreases the opportunity for condensation and prevents moisture problems. Sealing us your home means less pollen, dust and pests are introduced to the living space. Less drafts mean more comfort. You would want a window open while running your furnace or air conditioner. All those gaps and cracks add up! Tightening your home means your dollar bills won’t fly out the window.